UPDATED 25 FEBRUARY 2019: The location of the banquet after party has changed. Please join us at the Apollo Ballroom at The American Hotel. UPDATED 21 FEBRUARY 2019: A limited number of tickets for the banquet are left. If you would like a banquet ticket, please contact info@whirlygirls.org. It’s first come, first served. When is HAI HELI-EXPO taking place? The expo hall will be open March 5 – 7, 2019. Some classes take place before the expo hall opens. 7 pm — Banquet in the Apollo Ballroom with the theme of The Great Gatsby. 10 pm — Post banquet social at the Apollo Ballroom in the American Hotel. Please note this is a change in venue! How do I get banquet tickets? A limited number of tickets for the banquet are left. 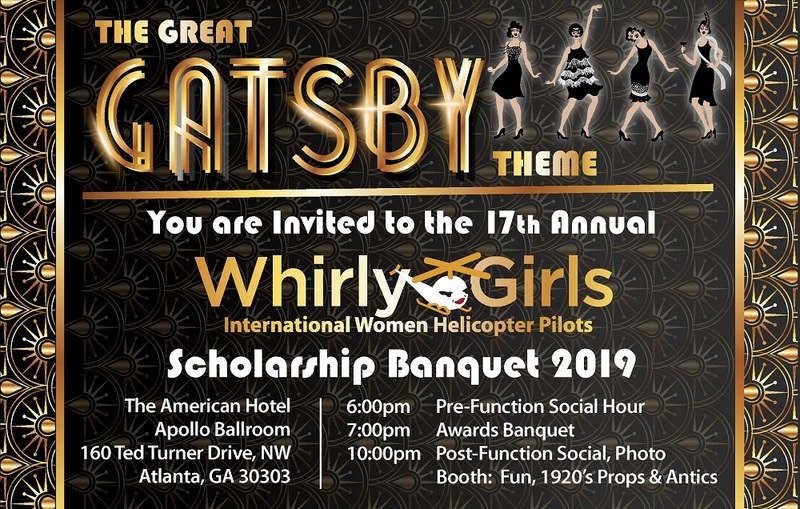 If you would like a banquet ticket, please contact info@whirlygirls.org. It’s first come, first served. Please join us at our other events on Monday, and visit us in the expo hall at booth B3507. All Whirly-Girls meetings on Monday will be held at the Georgia World Congress Center in room B316. Look for the Whirly-Girls merchandise and membership information at booth B3507 in the expo hall! Better yet, join the team, and volunteer to help out! Where can I stay in Atlanta? OnPeak is addressing room reservations for the event. Please note that if you check the housing link on the HAI website (http://heliexpo.rotor.org/index.php/hotel-travel/), it will show that many of the hotels are already full. The Whirly-Girls have reserved blocks of rooms in several approved hotels near the Georgia World Congress Center (GWCC). Those that are not within easy walking distance of GWCC will be serviced by free HAI buses during the expo. Details are below. The Whirly-Girls have reserved blocks of rooms in the following hotels. Please note that prices listed below are average nightly rates and do NOT include taxes or fees. Embassy Suites Atlanta at Centennial Olympic Park, 267 Marietta Street. $243/night for single, double, or triple occupancy. Two-room suites include two double beds (or one king-sized) and one converted sofa, so three can stay comfortably. Breakfast and happy hour included. Close to GWCC, no bus required. Scholarship recipients and board members will be staying here – come join us! The American Hotel Atlanta Downtown at 160 Ted Turner Drive NW. $215/night for single or double occupancy. The Whirly-Girls Awards Banquet will be held here. Free bus service to/from GWCC provided during the expo. Omni Hotel at CNN Center, 100 CNN Center. $239/night for single and double occupancy. This is the headquarters hotel for HAI HELI-EXPO. Across the street from GWCC, no bus required. Hampton Inn & Suites Atlanta Downtown, 161 Ted Turner Drive NW. $192/night for one king or two queen beds. Free breakfast and in-room wifi. Free bus service to/from GWCC provided during the expo. Hilton Garden Inn Atlanta Downtown, 275 Baker Street NW. $223/night for single, double, or triple occupancy. Complimentary in-room Internet access. Close to GWCC, no bus required. Westin Peachtree Plaza, 210 Peachtree Street NW, $196/night for single or double occupancy. Free bus service to/from GWCC provided during the expo. What if I don’t want to stay in any of these hotels? You are welcome to make your own arrangements. To avoid unexpected charges, please be cautious when entering any financial arrangements with hotel resellers who are not affiliated with HAI HELI-EXPO. Note that if you are not staying in a hotel listed on the HAI website (see link above), you will be not be on the HAI bus route to and from the convention center. What if I want to share a room? Sharing a room at HAI HELI-EXPO is a great opportunity to spend time with other Whirly-Girls, and it helps lower housing costs. If you are interested, please contact WG#1788 Laura Ilunga at lulu2lauri@gmail.com. She’ll hook you up with others who are interested in sharing rooms for the event.